I have been working with Bonsai for over 35 years and I have used all sorts of table, turntables, stands made fro Hairdressers chairs and none have really satisfied all the things I wanted from a workstation. So I designed my own. 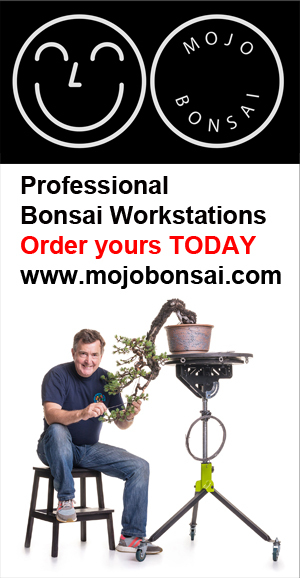 Selling via MojoBonsai these tables answer all the problems I encountered when working trees. They go higher than any other purpose-built Bonsai workstation. They ‘tilt’ up to 90 degrees so that means no more wooden wedges/block etc. And they fold flat for easy storage no other turntable does all these. I will be attending Major shows throughout Europe if you would like to see these table close up. All tables fitting are Marine Grade Stainless Steel, the working surface comprises two-piece 18mm marine ply with precision turntable with a 3mm thick fine ribbed anti-slip rubber matting. All elements are secured with stainless steel bolts. An Indexing plunger spring loaded retractable locking pin secures the turntable. The Professional workstation for the discerning artist, maximum height and loading. Designed for the enthusiast, great height and workspace, the same as the pro but with half the loading. Designed for the enthusiast, great workspace.